• In this world there is never a problem of AD (certainly not in the long period). At the “natural interest rate” all savings are invested. • Both in practice and in theory investment does not depend on the interest rate. • Theory: Sraffa (Piero not Angelo, the son not the father) initiated the controversy on capital theory (the controversy between the two Cambridges) that destroyed the foundations of neoclassical theory. More specifically, the demand functions for “production factors” are not “well behaved”. This was acknowledged (by the MIT side), and rapidly forgotten. Any honest scholar would recognize that all that you have studied (including the labour and capital demand curves, Solow’s model, the Heckscher-Ohlin theorem, monetarism, DSGE models, Endogenous growth theory, almost everything you studied) is analytically wrong. But honesty has not prevailed in Economics, after David Ricardo’s death in 1823, as Marx taught us. • This vision is precisely the opposite to that which prevailed before the monetarist counter-revolution of the seventies. • In the Keynesian view full employment was an international question. • By this view (especially in its long-run, more genuine, version) output depends on AD. Income distribution matters for aggregate demand (inequality is an obstacle to growth, as Larry Summers has lately admitted, acknowledging that PK economist are far ahead in this respect). • Controls over capital flows assured a degree of independence of monetary policy in the Bretton Woods regime. Necessity of an international Keynesianism: why? • The balance of payment equilibrium was the main constraint to national full employment policies. The classical example is the Mitterand government in the early 1980s. If partners do not cooperate, you cannot pursue national Keynesian policies. • Unless: trade controls (not opposed e.g. by Federico Caffé), or exchange rate flexibility. • Prof. Amato à Keynes’ proposal of an International clearing union that somehow obliged surplus countries to recycle their surplus (there is a similarity with the arcane European payment system called Target 2, but this would lead us too far away). Germany: the European and global problem? • Since the early 1950s Germany has deliberately pursued a neo-mercantilist model. • Rationale à Michal Kalecki (the Marxist Keynes) à Profits derives from the capitalists’ surplus (the difference between net output and wages ß Ricardo/Sraffa). Lower wages à higher profit rate, but also, lower wages à lower domestic demand. Necessity of external markets à government spending, autonomous consumption, exports. • A mercantilist strategy combines wage repression with high profits in fixed exchange rates regimes (BW, EMS, EMU). • Called Monetary mercantilism by the German leading economic-historian Carl-Ludwig Holtfrerich. Violation of game rules of a MU. • From 1995 on the Italian economic policy has been more consistent and fiscal policy more conservative. The external competitiveness regained in 1992 was slowly eroded. Both factors might explain the stagnation of labour productivity from 1995. • Apart from Paul DeGrauwe who in an article on the FT envisaged a construction bubble in Spain, fuelled by capital inflows, followed by a BoP crisis, nobody foresaw that the EMU might incur an internal BoP crisis. Note that Giavazzi and Baldwin arrived at this obvious interpretation with years of delay. • Incomplete monetary union generates financial crisis (indebtedness of the periphery, sudden stop of capital flows, default). In Europe the financial (BoP) crisis did not explode because of TARGET 2 (Sinn) and the delayed ECB intervention (whatever it takes, OMT). Very complicated story. • Of course you do not meet BoP crises in the US. This leads us to the basic flaws of the EMU: the US are a complete, viable monetary union, the EMU is not (and will never be). • In a full, viable MU a federal budget (assisted by a cooperative CB) operates fiscal transfers and anti-cyclical policies. Full financial integration and a full banking union avoid a doom loop between local banks and governments. • A full, viable MU implies a political union. Is a federal, progressive Europe possible? Next question, please. • Hayek 1939: the opposition of core countries to a tax-transfer union implies that only a liberal (ordoliberal as by now everybody has learned to say) Europe is possible. • Europe is the Mecca of the liberals (in the European sense), and not of the liberals (in the American sense). • The nation-State is the traditional arena of the social conflict (that is of democracy) over income distribution (direct and indirect wages) and economic policy. • Supra-national institutions humiliate national democracies (that ordinary people is incapable of taking care of themselves is openly declared by the most honest pro-Europeans, and of course by mainstream economists). • Germany said no. The German interpretation of the crisis is that too little and not too much discipline characterised Europe. • So the German proposals aim to remove the control over national budgets from the Commission (too political bargaining) and assign it to technocratic authorities like the EMF. • where d is the public debt/GDP ratio, r is the average nominal interest rate paid on the public debt, g is the nominal growth rate, and s is the primary balance/GDP ratio. • With a sufficiently low interest rate (lower than the growth rate) the stabilization is consistent with a primary fiscal deficit, that is a moderate expansionary fiscal stance. • A similar proposal from Folkerts-Landau (chief economist of the DB): a grand bargain between Italy and Europe comprised of low interest rates and support for Italian growth in exchange of a firm commitment to fiscal stabilization. • Current situation r > g, s > 0. We need g > r and s < 0 (we also need a German-led recovery to avoid BoP problems à but Berlin refuses to expand). • In my view, it would be unacceptable for Italy to implement this on the terms proposed by Folkerts-Landau, i.e. through an application of the ECB's Outright Monetary Transactions (OMT) accompanied by a memorandum of understanding and an intervention of the European Stability Mechanism (ESM). But an honourable solution could be found. 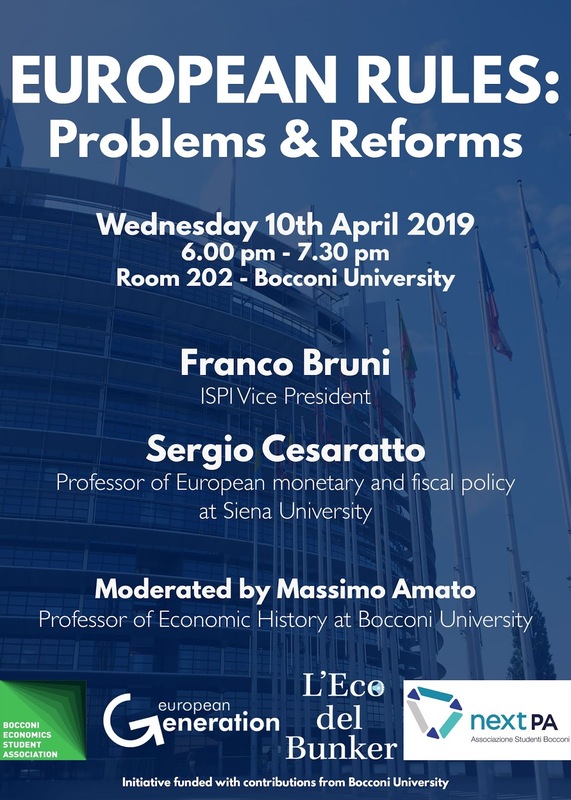 • The question is the lack of credibility of the last governments in Italy (all prime ministers included) and the lack of will (and economic ignorance) on the European (read, German) side. • The question might become actual again in case a new financial crisis with the spread going up. • Better to avoid it. Yes, of course. Cesaratto, S. (2018), The nature of the eurocrisis. A reply to Febrero, Uxò and Bermejo, Review of Keynesian Economics, Vol. 6 No. 2, Summer 2018, pp. 240–251 (working paper version Quaderni DEPS n. 752). Sergio Cesaratto & Gennaro Zezza, 2018. "Farsi male da soli: Disciplina esterna, domanda aggregata e il declino economico italiano," WorkingPapers 2018-05, Universita' di Cassino, Dipartimento di Economia e Giurisprudenza (forthcoming in L’industria in a special number in memory of Marcello De Cecco). * Unfortunately the publisher has closed. A new edition of the best-selling Sei lezioni should be published next autumn with a new publisher .